James Joseph McMenamin, born 16 August 1874, Whanganui, died 8 June 1917, Messines. On 8 June this year, commemorative services will be held in Messines, Belgium, Nieppe, Northern France, and at Sacred Heart Church, Petone, to mark the centenary of the death of army chaplain and Petone Parish Priest, Fr James Joseph McMenamin. He was killed while burying the dead during the Battle of Messines in World War I, 8 June 1917. 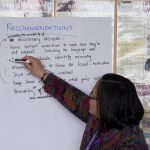 Planning for the services began three years ago when representatives of the New Zealand Pilgrimage Trust in Belgium started the development of an app for the Messines battlefield. 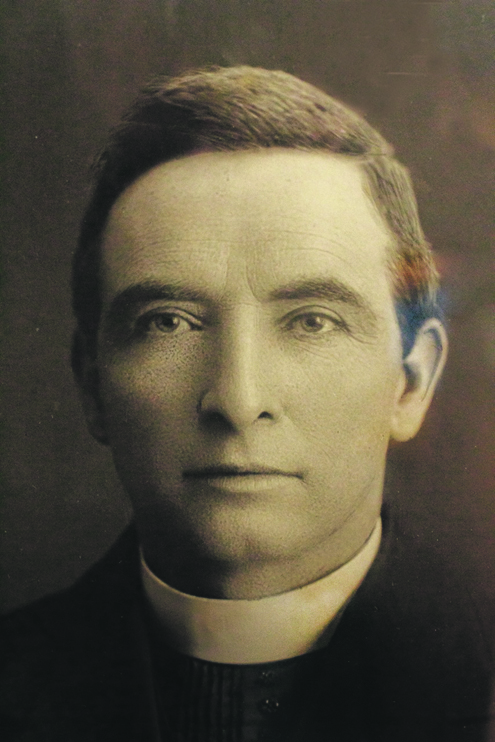 They contacted Sacred Heart in Petone to find out more about Fr McMenamin and learned, despite the almost 100 years since his death, Fr McMenamin is remembered in a number of ways in Petone. His photo stands in front of the altar at Anzac Day services; his engraved chalice, given to him by parishioners when he went overseas and returned to the parish after his death, is used every Sunday; and the stained-glass window dedicated to his memory is situated behind the altar. James McMenamin was born in Whanganui in 1874 but his family later moved to the Hutt. He and his brother William had a tailor’s shop on High St and James played cricket for the Waiwhetu Cricket Club. Fr McMenemin landed at Anzac Cove with NZ Expeditionary Force, 25 April 1915. At the age of 28, James was in the first intake of seminarians at Holy Cross seminary, Mosgiel, and he was ordained by Bishop Verdon in 1909. After two years in Westport, he was appointed Parish Priest of Sacred Heart Petone, succeeding his mentor Fr Maples. Fr McMenamin enlisted for service as an army chaplain in August 1914 and went overseas with the NZ Expeditionary Force. He went ashore at Gallipoli early on the first day of the landings and during his time ministering to troops in the terrible conditions, he became greatly respected and admired by all soldiers, whatever their rank or religion. Another chaplain wrote, ‘No place was too hot for him. He carried water, he helped the wounded to the beach, he was up night after night doing good’. His health suffered terribly and he spent some weeks recuperating in Egypt before returning to Gallipoli. When he was invalided home in October 1915, his enlistment weight of 67kg had dropped to less than 44kg. After a period of recuperation in New Zealand, Fr McMenamin returned to England where he spent the rest of 1916 as a chaplain in New Zealand military hospitals. In January 1917, he returned to frontline duty in France, attached to 2nd Battalion on the Canterbury Regiment. He was killed by an exploding shell while burying the dead during the Battle of Messines on 8 June. His death is recorded on memorials as 9 June because that is the date his family was given. Fr McMenamin was initially buried in Messines but was later reinterred in the curé’s vault in Nieppe. That is the reason there will be two services to honour him on 8 June this year. Back home in Wellington, two Requiem Masses were held for him ‒ one celebrated by Archbishop O’Shea in the basilica on Hill St and the second at Sacred Heart Church in Petone. The parish wanted to commemorate Fr McMenamin’s great courage and service in a very tangible way and the second Sacred Heart Church, opened in 1934 by Archbishop Francis Redwood, was dedicated to his memory. Archbishop Redwood described Fr McMenamin as ‘a great hero and a great Christian who died discharging his duties as a priest’. 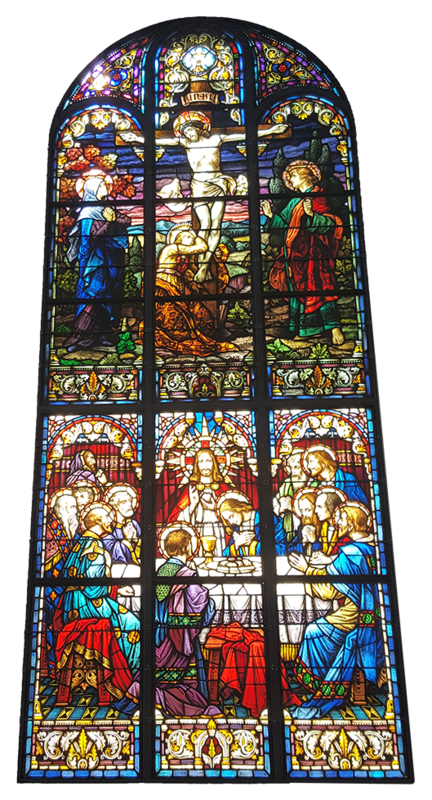 The memorial stained-glass window originally commissioned for the former brick church, now sits behind the altar in Petone’s present Sacred Heart Church. Stained glass window dedicated to Fr McMenamin now sits behind the altar in Petone’s present Sacred Heart Church. 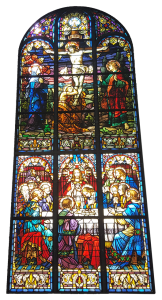 The memorial window was originally commissioned for the former brick church, built 1933‒34, and opened by Archbishop Francis Redwood who described Fr McMenamin as a ‘great hero and a great Christian who died discharging his duties as a priest’. 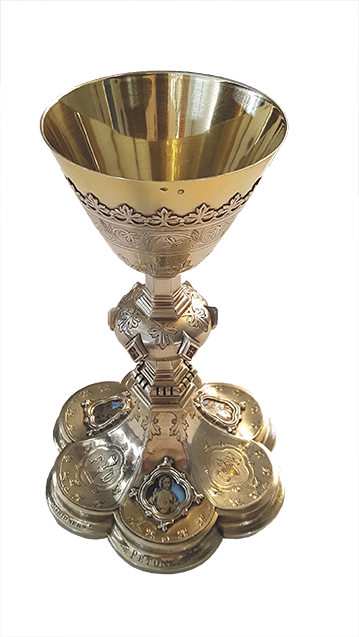 The organisers of the Messines commemorations requested that Fr McMenamin’s chalice go back to Belgium to be used during the services on the anniversary of his death this year and to be on display at the Messines museum during the commemorative activities. 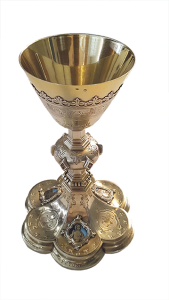 The parish has agreed and the chalice will go to Belgium under the protection of the diplomatic service in May. Students from St Bernard’s College, under the guidance of Head of Technology, Patrick Cassidy, are making a carrying case of native timber for the chalice. 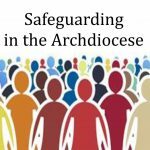 They will present the case at a special Sunday Mass at 9.30am, 21 May, at Sacred Heart Church, Petone. The chalice will be handed over to the Ministry of Foreign Affairs and Trade with special blessings for its safe passage and return to New Zealand ‒ a journey that it made more than 100 years ago. The New Zealand Defence Force will be represented at the Mass on 21 May by Chaplain Roger Black and Anthony Hawes, Principal Defence Chaplain. 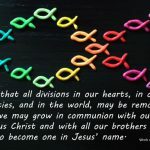 After three years of communications with the Belgian organisers and research and planning in New Zealand, it will be poignant and memorable to see a priest of our Archdiocese honoured in this way. Fr McMenamin’s service and sacrifice. Petone parishioner Sharron Cole and her husband Richard will attend the services in Messines in June. The commemorative Mass for Fr McMenamin at Sacred Heart Church in Petone will be at 7pm on Thursday 8 June.